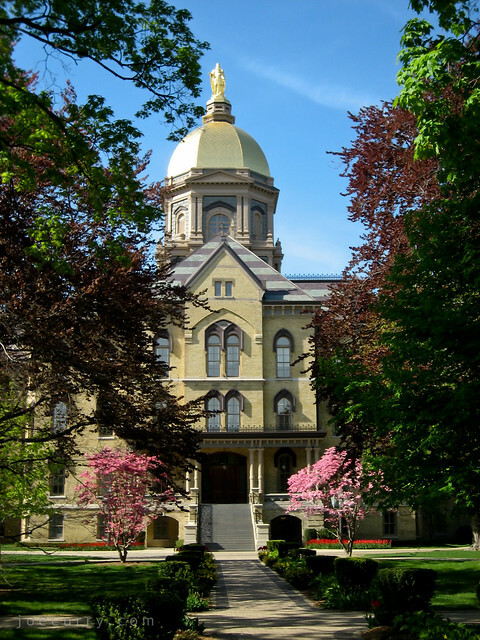 A beloved building on the campus of Notre Dame, the Main Building serves primarily as a headquarters for administration, although it still contains classrooms, harking back to a time when students learned, ate meals, and resided there. It was built in 1879 and the Golden Dome was added in 1882, most recently regilded in 2005 (right before I attended MBA school). The regilding process uses only about a fist-full of gold leaf to cover the entire structure. On top of the Dome is a 19-foot-tall, 4,000-pound statue of Mary, the Mother of God, “Notre Dame” (“Our Lady”).